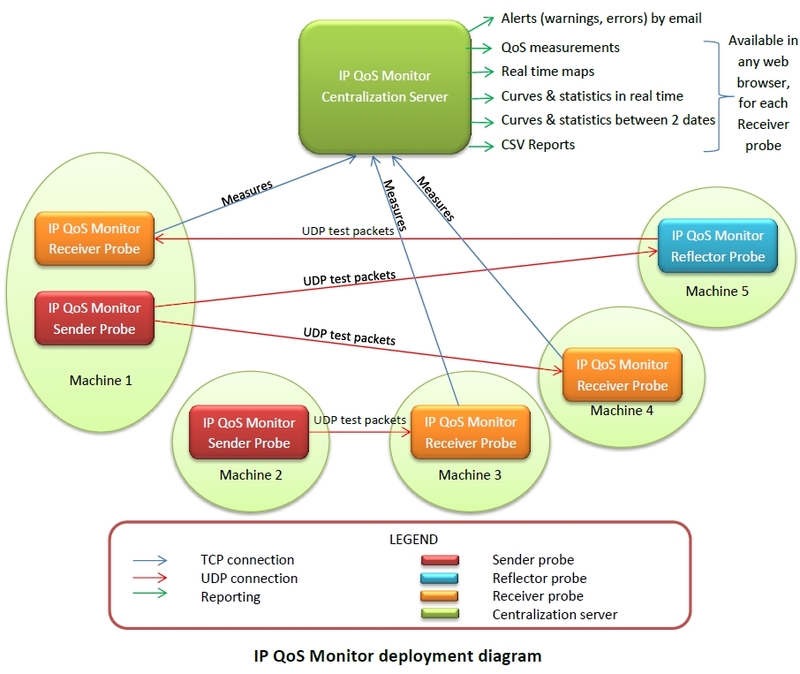 IP QoS Monitor is a flexible and scalable solution to monitor the most important parameters concerning Quality of Service (QoS) in IP networks. but also from the real paquets of the transmission you want to monitor (thanks to packets sniffing). For real traffic monitoring: the user can choose the transmissions to monitor in a non-intrusive manner. Then each detected packet will be identified by a quasi-unique fingerprint. Using these fingerprints, the packets sent by one machine will be compared to the packets received by another machine. This comparison will produce the QoS measures: packets loss, packets delay, packets jitter, packets re-ordering. For test packets: the user can choose the size of the test packets to send, their number and the frequency at which they must be sent. 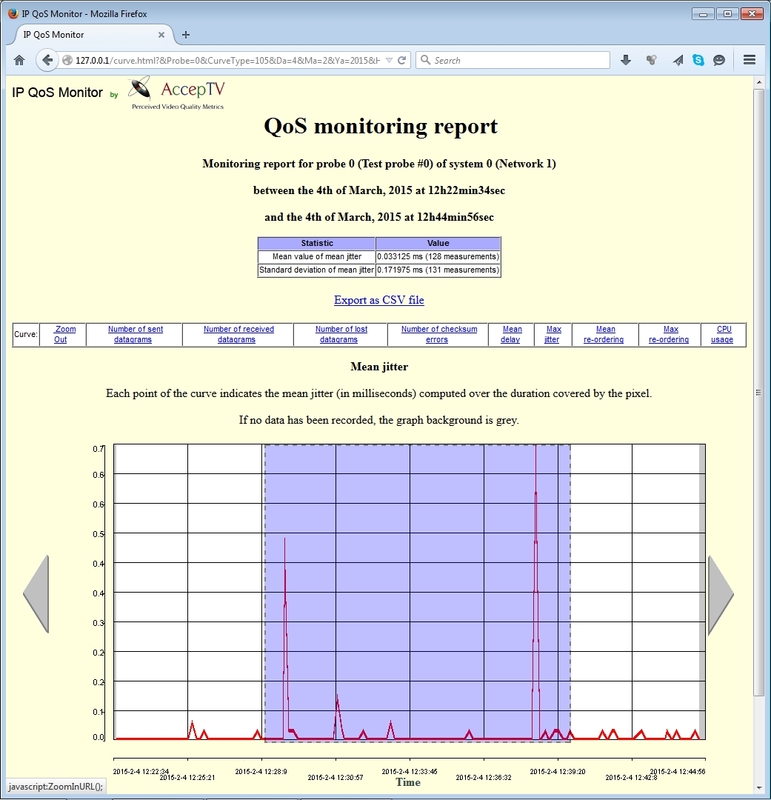 IP QoS Monitor is scalable. Indeed, it supports from 1 to 1000 probes (for more: contact us). 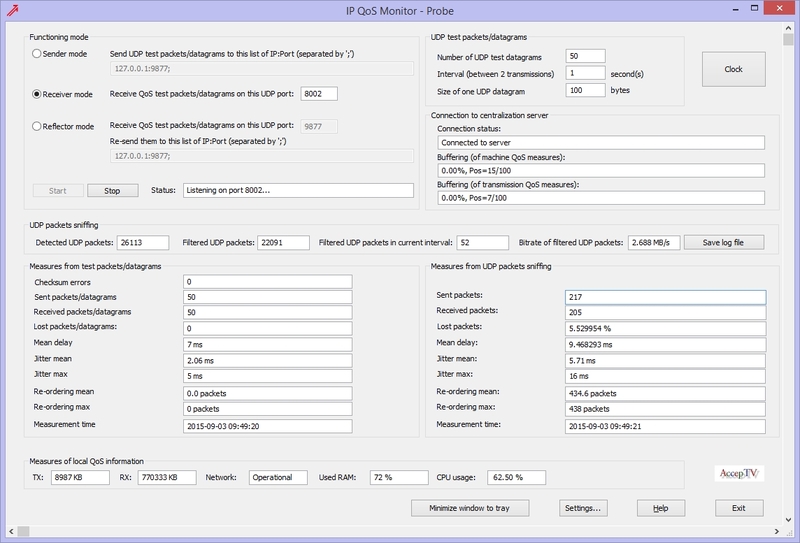 And IP QoS Monitor supports from 1 to 1000 users (for more: contact us), each user being able to define thresholds and durations (for a specific probe or for all probes) to trigger alerts (two levels of alerts: warnings and errors). 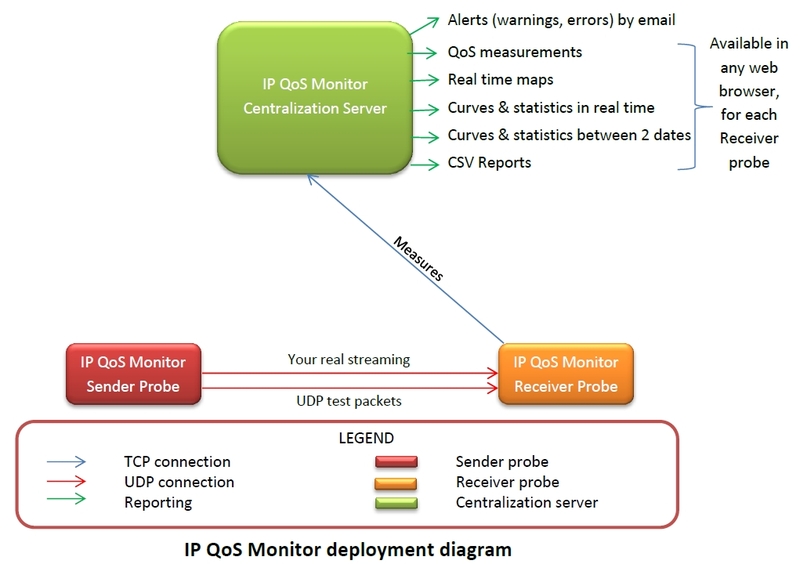 IP QoS Monitor can be used for most types of IP network: it can monitor QoS for networks ranging from corporate networks to very small local networks. And thanks to its modular architecture based on different types of probes and servers, IP QoS Monitor can be easily adapted to your network architecture. Moreover, IP QoS Monitor probes and servers are fast and a single PC can easily run several probes and/or several centralization servers. And a single Sender probe or Reflector probe can send test packets to multiple Receiver probes. ...just ask for an evaluation version of IP QoS Monitor now!